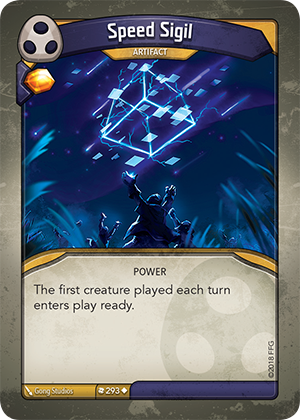 Card Text The first creature played each turn enters play ready. Does Speed Sigil’s ability affect both players? Yes. Speed Sigil affects the first creature played on each turn. Does Speed Sigil’s ability take effect the same turn it’s played? Yes. If you have not played any creatures before playing Speed Sigil, the first creature you play on this turn will enter play ready. If there are multiple Speed Sigils in play, does more than 1 creature each turn enter play ready? No, Speed Sigil applies only to the first creature played each turn. Thus, multiple Speed Sigils have no additional effect.